Love is most certainly in the air with this easy Valentine Hot Air Balloon! Perfect as a Valentine holder or for a sweet surprise for your loved ones to find when they get up in the morning or when they come home at the end of the day. I have seen many a Hot air balloon craft with Paper Lanterns and Balloon Shaped Templates but THIS Heart Shaped Hot Air Balloon ISN’T ON PINTEREST…… YET! It’s an original idea from yours truly! So just remember, you saw it here first! Let’s not waste any time and get to it! You will find it is really easy and I have two different options for you to choose from when making the basket/base. Depending on level of difficulty for you. Guarantee you will love this no matter which way you go. The possibilities for decorating are endless! Whether its solid paper, or your favorite print, whether you use pinks, red, lavender or white, I’m not sure if its more fun to make them, though I am certain the yummy treats, notes or surprises you place inside will be greatly appreciated! *Hearts punched out or purchased at the craft or dollar store. *pot for a plant. This will be the actual “basket” ( I found mine at the dollar tree, its made of a papery material, see photos) or you could also use this metallic bucket I found at the Dollar Store as well. *Wire Cutters or some kind of sharp cutter to size the skewer correctly.I wouldn’t use an exacto though. Too slippery and dangerous. Be safe ya’ll. *32 inch Bamboo skewers. You will need 1 cut to 18-20 inches for the heart. Save what remains remains to cut for a bar across the opening of your basket. *any additional flowers or embellishments you want too use to decorate your basket. *Glue sticks ( 6-8) You go through these pretty quickly since you have to glue the hears together. You can also use you glue gun if you prefer. Here is how you put together the heart template that you are going to use for the hot air balloon. two circles of 5.5 inches and join them on the bottom. You are ready to go! Trace and cut your 12 hearts using your template onto your posterboad or cardstock. If you use poster board (which is more cost effective) be sure you use 2 of the standard size poster boards or twelve sheets of your favorite Valentine colored 12 x12 inch cardstock. Please make 12 hearts! Not more, not less. There is a method to my madness and you will understand why shortly. Score, fold and glue together all 12 hearts together in the same direction, folded sides all on one side. Once glued together using your glue stick, you should be able to open your heart like a book. but Don’t glue it closed just yet. Open your glued together hearts and lay flat on your table. All the sides will or should be glued in pairs except for the last set. Place some masking tape on the “spine” of your heart. This helps reduce the surface area and avoid wasting glue by going into the creases. Place your skewer and glue on then glue it shut. Glue rope with glue gun around your pot/bucket/round container. Take some the remaining piece of bamboo skewer and cut a piece to fit across the mouth of your basket. Glue together the intersection of the skewers, as seen in photo below and wrap some jute around it as you secure it tightly and at 45 degrees. It’s not that tricky, you just have to tie it tight and straight. Then glue that bad boy like crazy! If for whatever reason you are not comfortable with doing this. Simply buy a wider mouthed container where you can fit some floral foam into. Glue the foam to the bottom and push the skewer in. NOTE: don’t fill the basket of the foam all the way to the rim. You want to leave space for chocolates, candy, stuffed animals. I found this floral foam at the Dollar Store. They sell them in packets of 2. I bout two packets and glued the 4 togher with the glue gun. The tin container was also a Dollar tree find. Take four pieces of Ribbon of your choice, cut to about 16 inches each. Here is where you are going to thank me for insisting you make this with 12. Find the part of your basket you want to use as your front. That will be your “12:00” use your glue gun and attach the upper section of the ribbon on the upper half of the heart. Folding it, so it wraps around both sides. That way the ribbon flows downward straight and not twisted to one side or another. Attach it to the rim of your basket on the inside. Repeat this process at 3:00, 6:00 and 9:00 o’clock of your air balloon That way the ribbons are evenly distributed around your pretty balloon. Then let the decorating begin! I have various options and ideas to suggest. I used foam hearts and candies as the sandbags at the Dollar Tree. I glued the bigger hearts around the outside rim of our air balloons basket and I used the smaller ones with twine to make heart garland to attach around the ballon using my glue gun. See photos below. For the garland, start attaching it where you just placed the ribbon. Go all the way around. You should have 4 garlands and the last one will finish where you started to glue your first garland. Once your “sandbags are tied and your hot air balloon is decorated. Fill it with candies, cards, stuffed animals, jewelry, coupons or whatever else you can think of for Valentines day! I also came up with a more adult friendly version of this whimsical little craft. I used roses and came together with something entirely different, very boho chic. Any mom, daughter big or small would love to wake up to something this sweet next to her night stand. Could you imagine a whole bunch of these this in white for a bridal centerpieces? I think that will be my next update to this sweet and versatile romantic design. Be sure to share your creations with me, I’d love to see what you come up with! Don’t forget to shop for your Valentine Card needs in my card shop. This card featured here is one of the new designs of my 2019 Valentines Collection, be sure to shop here before you leave our website! What about for guys? No problem! Just make a version using a HOT RED. Decorate with red roses and red hearts. Fill with chocolates, coffee, coupons, gift cards or any other favorites! 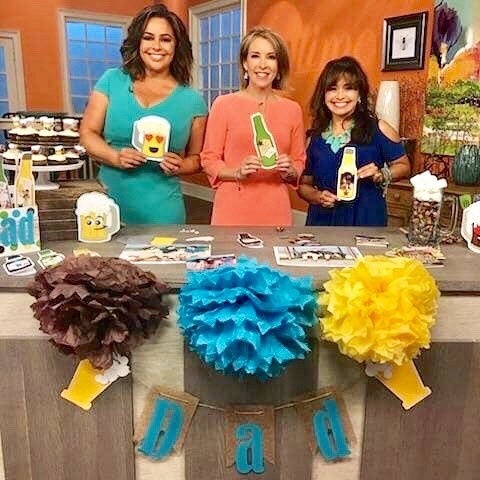 My next post will be my TV segment on Daytime TV Show with Cyndi Edwards and Jerry Penacoli making this project! So stay tuned! That is always fun!